longer and 25% off for week or longer stays! How many people can our cabins accommodate? Do we have our own full bathroom? Do all of the cabins have hot tubs and where does the water come from? How hot is the water? How far are the cabins from Asheville and The Biltmore? What should I bring with me to the cabins? Do I need wood for the fireplace or charcoal for the grill? What about gasoline and groceries? Do the cabins have a TV? What about having a bonfire? Are there any stream or creeks at the cabins? Can I bring my motorcycle or trailer? Do you have any brochures you could mail to me? How do I make a reservation or contact you? Are your availability calendars really accurate? What about a waitlist or cancellations? Do you have any packages or specials? What is your cancellation policy anyway? Do cell phones work in the area? Is there a phone in our cabin? What do you consider to be holidays? What if you ONLY have 2 nights available during a holiday period or October- Can I reserve just the two nights? How do I pay for the cabin? I am interested in a cabin, but I am not bringing a pet and I don't want to "smell" any previous pets! I want to know more about Lake Lure,North Carolina! What airports are closest to Pine Gables Log Cabins? Click here for a drawing of Pine Gables. Check Availability and Reserve Your Log Cabin! *How many people can our cabins accommodate? We have designed all our new one bedroom cabins ( Fish Pond Cabin, Duck Pond Cabin, Owl's Nest Cabin and Ceilidh Cabin) to be a romantic couple's retreat, therefore we limit our occupancy to 2. * Please note - If occupancy of any cabin is more than the stated maximum occupancy, you may be asked to leave with no refund and/or there will be a charged of $100 per extra person per night. * Children count as occupants. We are in the process of becoming as energy efficient and eco-friendly as possible. We are adding insulation and replacing old appliances with Energy Star rates fixtures (as we can afford them). Of course our new front load washer/dryers, heat pump (21 SEER), dishwashers and televisions are all Energy Star rated. We have replaced our bed linen with luxurious certified organic sheets. When possible we have purchased local made furniture. We have recycling bins in the cabins. We primarily use natural hypoallergenic cleaners. When available we buy reused or recycled products. We're not totally green, but we are headed in that direction! Any suggestions would be more than welcome. Believe it or not, this is a popular question! Please put your mind at ease that in addition to the full kitchen, each cabin also has a toilet and shower . No trips to the outhouse at Pine Gables Cabins! Tootsie's Cabin has a very small bath room and is not recommended for large folks. We regret that we CANNOT accommodate one night guests under any circumstances. Plan instead on coming for a visit when you have at least two nights (or more) to really enjoy your cabin! Please, bring your pet to any cabin (except the Duck Pond Cabin)! You are required to keep your pet on a leash and your pet must be under your control at all times. We have a lovely Meadow that is for all our guests to enjoy, both human and canine! We normally allow two pets to come with you, but contact us if you wish to bring more than two pets or pets other than dogs, and we'll do our best to accommodate you! Your $35 pet fee is a one-time fee that covers your pets for the entire length of their stay. We take your $35 pet fee and donate 1/2 of it to the local spay and neuter program. This means that every time you bring your pet to Pine Gables Log Cabins, money will be donated to help the animals of Western North carolina. Children are welcome but they do count as a guest when calculating the occupancy. All the new log cabins and Wandering Bear Cabin have a private hot tub on a covered porch and they are open year round. The two historic log cabins and Raven's Roost do not have hot tubs. The hot tub water comes from the Town of Lake Lure Water system. We rigorously maintain our hot tubs with chlorine and proper filtration. And no, a swimsuit is NOT required! We set the hot tubs to 100 degrees although you are welcome to raise or lower the temperature. 104 degrees is the maximum temperature of our hot tubs (set by the manufacturer for health and safety reasons). Where do we start? There's great hiking at Chimney Rock Park, plus rafting in local rivers and The Lake Lure Inn Spa. Lake Lure has excellent restaurants too. Please see our Area Info & Activities page for details. We also have a "Pine Gables Adventure Book" in each cabin with maps, brochures, and ideas for how to enjoy yourself in our gorgeous area. We are less than an hour from Asheville and The Biltmore. See our Driving Directions page for maps of the area. There are excellent restaurants in Lake Lure such as The Lake Lure Inn, The Point of View and Larkins on the Lake. Please see our Area Info & Activities page for details. We have tried to stock the cabins with everything you might need except yourself, toilet accessories and groceries. Please see our Cabin Amenities page for a complete list of what we provide and what to bring. Jim's Cabin, Wandering Bear Cabin, Raven's Roost and Tootsies Cabin have a charcoal grill and you will need charcoal. In the new log cabins, the fireplaces are gas and on a timer. The grills at the new cabins are gas and propane is provided. What about gas and groceries? There is a nearby full size grocery store and a convenience store. Please see our Driving Directions page for suggestions on where to stop for groceries and fuel. Yes, we have a wall unit A/C in the historic cabins and there are energy efficient heat pumps in the new cabins. Yes, they each have a TV with satellite TV and a DVD player. Absolutely no smoking is allowed inside the cabins, although we do provide an ashtray that you are welcome to use out on the porch. Absolutely no bonfires, campfires, etc. are allowed on the premises. The risk of a fire spreading is simply too high. The use of fireworks or firearms of any kind are not permitted. Are there any streams, creeks or branches at the cabins? Yes, along with Lake Lure, and our three private ponds there is a small branch at the western side of our property. Many guests have enjoyed our cabins on motorcycles. We do have a gravel driveway, so folks on sportbikes need to be careful. All motorcycles must have proper mufflers. Please email us before bringing trailers, motorhomes, or extremely low-clearance vehicles. Sorry, we do not have any printed materials or additional pictures as we have included everything on this website. How do I make a reservation or contact you with questions? Please click on the "RESERVE YOUR CABIN NOW" here or on our reservations page. You can then access our real time availability program and reserve your cabin safely and securely online. If you have questions, please email us at: PineGables@aol.com. When you make a reservation with us we give you our home office phone number so that you can call us if you have questions or concerns. We forward that number to a cell when we're away from home and it rings on our bedside table at night. We do not have our phone number on the website as we cannot take a reservation or "check availability" over the phone unless we have internet access to our online reservation programming. (Typically, we are away from our computer during regular business hours as that is when we clean cabins, buy toilet paper, or work at other jobs.) We check emails at least every morning and evening and will respond promptly. If you have questions that I haven't addressed, please allow us to email you back or call you at a time that we have internet access. Giving our number to reserved guests only allows Jim and Robin to personally answer all phone calls, emails, and reservations to ensure quality customer service for our guests. We are "on call" for our guests 24/7/365. Thank you for your understanding. Are your availability calendars really accurate? What about cancellations or a a waitlist? If you would like us to notify you if we receive a cancellation, please email us at PineGables@aol.com and we would be happy to do so! We highly recommend buying travel insurance if there is any possibility of cancelation. Go to https://www.insuremytrip.com/ for more information. Stay with us 3 or more nights and receive a 6% discount. Stay a week or more and you get a 25% DISCOUNT! A great value! Please click on the "RESERVE YOUR CABIN NOW" for more information. If you are Active Military, please be sure to let us know so that we can have a bottle of wine waiting in your cabin for you to thank you for your service!!! Please click on the "RESERVE YOUR CABIN NOW" for more information. Cancellations 30 days or more before arrival will receive a full refund minus a $35 booking fee. If you do need to cancel, we will make every effort to rebook the cabin if you allow us enough time to do so. Please realize that if you cancel less than 30 days before your reservation, it may not be possible for us to rebook the cabin. We are just two people running this business and we prefer to price our cabins and packages such that they will enjoy practically 100% occupancy. We do not overcharge to compensate for empty nights, hence last minute cancellations affect us greatly. We highly recommend buying travel insurance if there is any possibility of cancelation. Go to https://www.insuremytrip.com/ for more information. The beauty of our area is the seasons!!! Everybody knows that the mountains are a cool respite in the summer and gorgeous in the fall. To many of us who live here, the winter is the prettiest time as you can see forever in the crisp air during the day, then snuggle up and feel cozy at night. Spring is quite a marvel too as you can still see very well through the trees, plus have the bonus of the daffodils, dogwoods, apple trees, forsythia, etc. greeting the new season in a riot of vibrant color. Generally, the roads are clear and travel is easy most all winter, although there may be a few days of light snowfall. US 74A, US 64 and NC 9 are all kept very clear. Sometimes! USCellular just put up a tower in Bat Cave so most cell phones will work at least some of the time. At the cabins, many cell phones can get service (especially standing on The Mini-Barn porch next to the landline! ), but many phones will not have a good signal inside the cabins. cell service is possible, but sporadic. Is there a phone in our cabin? There are no phones in the cabins. For your conveyance, there is a 'land line' phone at the mini barn. The Phone at the mini-barn now allows free calls to anywhere in the USA! What about email and internet? Our Property now has broad band wifi. Information about using our internet is in the Guest Information Book. 2 nights is our minimum stay. Please no check-ins or outs on Christmas Day or Easter Sunday! 50% deposit due at time of reservation with the balance due 30 days prior to arrival. We accept MasterCard, Visa, American Express or Discover. The remaining balance will be charged to the same credit card as the original reservation. Reservations cannot be confirmed or "dates held" until payment is made. Full payment is due at the time of reservation for stays within the next 30 days. You will receive a conformation email as soon as you make a reservation. When the second payment is processed you will receive an email with an itemized statement and another email with directions and the code for the key box. You do not check in at an office, you go straight to the cabin. We highly recommend buying travel insurance if there is any possibility of cancelation. Go to https://www.insuremytrip.com/ for more information. 6.75% sales tax plus 6% Rutherford County room tax. No, there are no extra cleaning fees with our cabins. We have a washer and dryer in the new cabins for your convenience only - we'll take care of the laundry! We do ask that you do the dishes prior to departure, or leave $10 behind for the housekeeper's extra time. There is a one-time $35 pet fee that we donate 1/2 to the local spay and neuter program. The animals thank you in advance!!!!! Of course you don't and of course you won't!!! No pets are allowed in the Duck Pond Cabin plus we clean the cabins very thoroughly and you would never know by smell or sight that a pet had previously enjoyed the cabin, other than seeing the "pooch pail" of toys. The cabins are mostly wood, with no carpeting so they clean up quite well and easily. Tootsies Cabin was built in the 1930s by CCC workers. Jim's Cabin was built in 1947 by Jim Washburn. Raven's Roost was built in 1964 by Francis Proctor, Sr. Our new cabins were built in the Fall of 2009. We're very proud of our cabins and hope you will enjoy them and all the personal touches you will find within! Jim's grandparents, Jim and Tootsie Washburn, started renting cabins soon after they purchased the property in 1946. Their grandson, Jim Proctor, started working here in 1972 and has spent most of his summers at Pine Gables ever since. Robin was born in Ohio and then spent most of her youth in Florida. Both Jim and Robin went to Warren Wilson College, in Swannanoa (near Asheville North Carolina). Jim married Robin in 1996 and they have spent many hours planning and "fixing up" the property. Robin is the naturalist and landscape designer of the two. Jim mows grass and is the handyman. Our cabins are our dream and we invite you to share it with us. Robin and Jim live at the old inn at the beginning of Pine Gable Drive. It was originally built as a stage coach stop in the late 1700s. It has two log cabins under the lap boards that date back to 1834 and 1877. I want to know more about Lake Lure and Chimney Rock, North Carolina! Please visit this site for more information about our great little town! Asheville Airport is southwest of town and is about 45 minutes away. Greenville/Spartanburg Airport, SC, is about 60 minutes away. Charlotte, NC, airport is about 90 minutes away. Our new bed linens are certified organic. 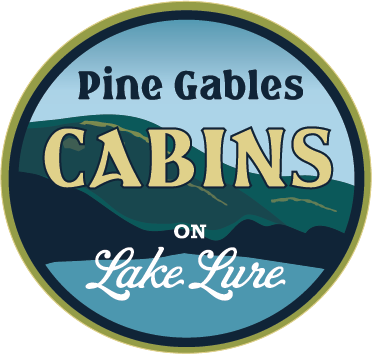 We are proud to offer you our private and secluded cabins at Lake Lure North Carolina! We look forward to having you as our guest at Pine Gables Cabins, the perfect place for a family get together, honeymoon, anniversary, or romantic cabin rendezvous. � Copyright 1997 to 2019 by Jim Proctor. All Rights Reserved. No portion of this site, including this home page and any of the separate pages, may be copied, retransmitted, reposted, duplicated or otherwise used without the express written permission of the copyright owner.